how to use spreadsheets in valuation. 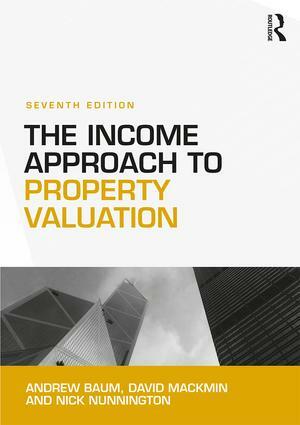 This extensively revised new edition is perfect both for students on Real Estate courses worldwide and for professional candidates working towards their final assessment of professional competence (APC) for the Royal Institution of Chartered Surveyors, needing to demonstrate a valuation competence at levels 2 and 3. Andrew Baum is Chairman of Property Funds Research and Newcore Capital Management, and Visiting Professor of Management Practice at the Saïd Business School at the University of Oxford. He was formerly Professor of Land Management at the University of Reading where he is now Emeritus Professor, Honorary Professor of Real Estate Investment at the University of Cambridgeand Fellow of St John’s College, Cambridge. David Mackmin is Emeritus Professor of Real Estate at Sheffield Hallam University. He was formerly Professor of Real Estate at Sheffield Hallam University, Visiting Professor of Valuation at the Technische Universität Wien and Course Director of undergraduate and postgraduate courses at the University of Reading. Nick Nunnington isVisiting Professor of Corporate Real Estate at Nottingham Trent University. He was formerly Principal Lecturer at Sheffield Hallam University, Sorouh Dean of Real Estate Management at the Higher Colleges of Technology in Abu Dhabi and subsequently an Associate Vice Provost for quality and curriculum development for professional courses across 17 colleges in the United Arab Emirates. He is now freelance with a variety of roles including teaching blended learning courses on the Master of Real Estate programme at the University of Adelaide, Australia.